I mean, it really has to be, doesn't it? Look at her. We love our son and think he's the most gorgeous creature ever to have walked the earth. Even if he isn't quite crawling yet. 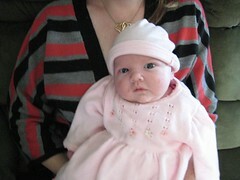 Our friends C and D had their second (Sarah) three weeks after us. We've started planning Fionn and Sarah's wedding already. It'll be great fun. "I think we're going to have to call off the wedding. Your child is the most precious thing I have ever seen. And ours is a wrinkled old prune. I just can't see them together. Fionn can do a whole lot better."